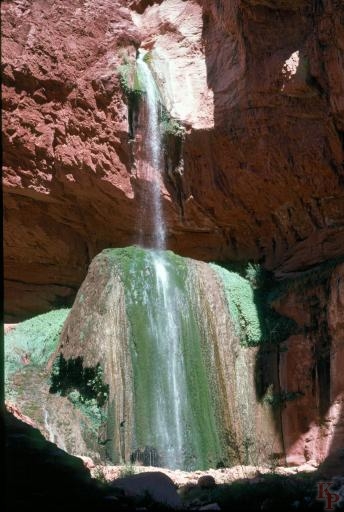 Phantom Ranch is a peaceful retreat in the bottom of the Grand Canyon. Accomodations are available (the last I checked, the full month 2 years out is released at the begining of each month, by 10:00AM it can be booked) in a variety of cabins (including bunk-house accomodations -- think hostel, or alpine hut). Meals (breakfast and dinner, or box lunches) are reserved separately, and are more readily available (but not always). The campground, which is more pleasent now -- you often cannot see the neighboring tent site, is also usually full. But in all cases, openings may be available on very short notice. There are more meals available to reserve than rooms so some campers can get some meals. Breakfast and Dinner are served family style with breakfast available early for hikers going up. 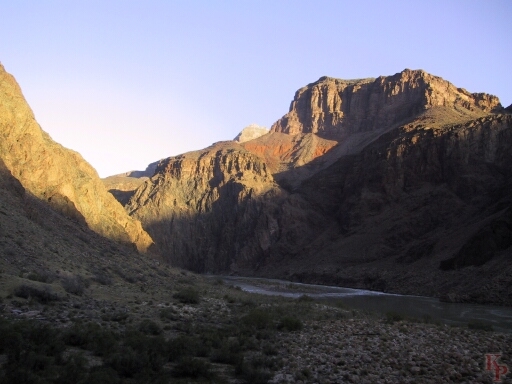 Morning on the Colorado River at Phantom Ranch. Shadows linger long after the official sunrise. 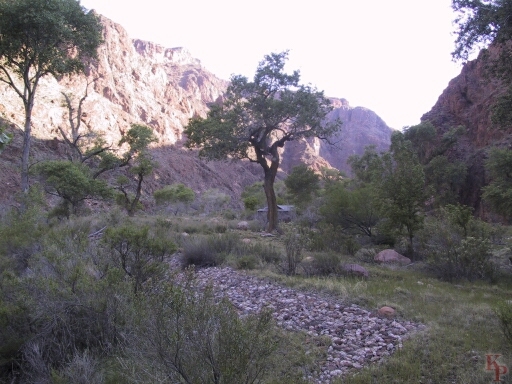 Morning on Bright Angel Creek at Phantom Ranch. Coming down the (South) Kaibab trail you finally sense that you will make it with the view of the boat beach, the lower (Black) bridge and Bright Angel Creek. The campground is in the trees, the Phantom Ranch lodge is up stream a bit. 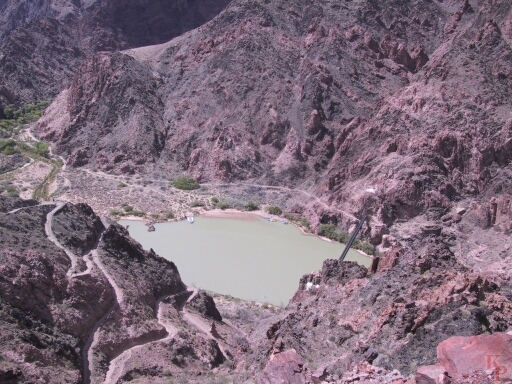 Silver Bridge over Colorado River in Grand Canyon. The bridge has oxidized a bit over the years and is now more the gray bridge than the silver bridge. The floor grating means the mules use the other (Black) bridge which has a solid rubber tread. This bridge is the hiking route to the Bright Angel trail and Indian Gardens. 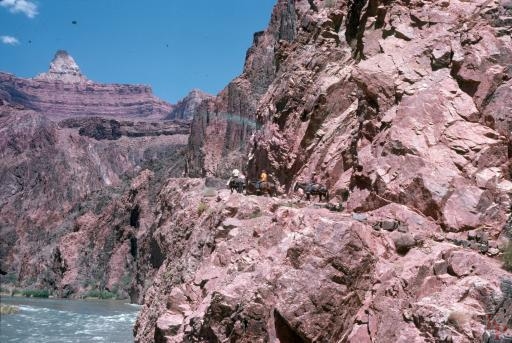 The mules take the detour along the Colorado River to avoid the Silver Bridge. 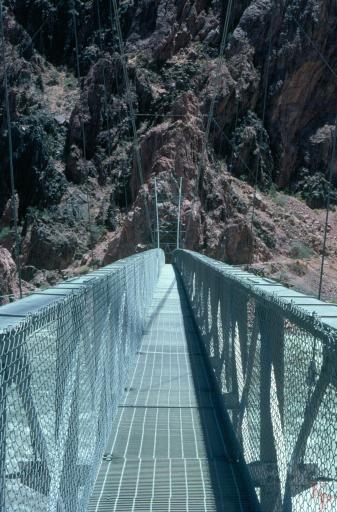 Hikers on the South Kaibab Trail also use the Black Bridge.